Brief Description: Brand new, sealed in it original box and with the complete accessories. Still available for sale and interested buyers should contact me. Detailed Description: Condition:	New: A brand-new, unused, unopened and undamaged. 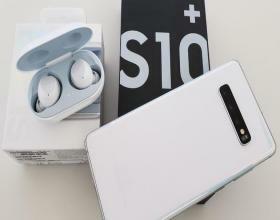 Lock Status:	Factory Unlocked Memory Card Type:	MicroSD	Camera Resolution:	12.0MP (Rear) + 16.0MP (Second Rear Camera) Processor:	Octa Core Samsung Exynos Processor	Model:	Samsung Galaxy S10 PLUS G975F Screen Size:	5.8"	Colour:	Prism Black, Prism Green, Prism White, Connectivity:	3G, 4G, Bluetooth, GPS, Quad-Band, Micro USB	MPN:	SM-G970F Features:	Email, 3G Data Capable, 4G Data Capable, 4K Video Recording, AMOLED Display, Camera, Colour Screen, Dual SIM, Fingerprint Sensor, FM Radio	Manufacturer warranty:	2 years Front Camera Resolution:	10.0MP	Operating System:	Android 9.0 Battery:	3400mAh Battery Capacity	Network:	Unlocked RAM:	6GB	Contract:	Without Contract Custom Bundle:	No	Style:	Touch Screen Model Number:	SM-970F	Bundle Listing:	No Manufacturer Colour:	Prism Black, Prism Green, Prism White	Specification:	UK Spec Country/Region of Manufacture:	Unknown	Storage Capacity:	128GB Modified Item:	No	Brand:	Samsung.